The Chanukah menorah (also known as a Hanukkiah) is lit around nightfall each of the eight nights of Chanukah. Every night, another candle is added, so that on the eighth night all eight candles (plus one helper) are burning bright. Some 2100 years ago the Land of Israel came under the rule of the Syrian-Greek emperor Antiochus, who issued a series of decrees designed to force his Hellenistic ideology and rituals upon the Jewish people. He outlawed the study of Torah and the observance of its commands, and defiled the Holy Temple in Jerusalem with Greek idols. Miraculously, the one-day supply of oil lasted eight days and nights, and the holiday of Chanukah was established. To commemorate and publicize these miracles, we light the Chanukah menorah (also known as a chanukiah) on each of the eight nights of Chanukah. This year, we start lighting the menorah on Sunday night, December 2, 2018. Light the menorah in your own home. If you are traveling out of town, set up your menorah wherever you will be staying for the night. 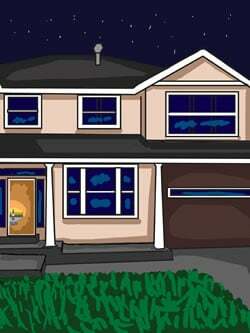 If you will be spending the night in a Jewish home, you have the option of giving your host a dollar or so, a symbolic contribution towards the menorah expenses, and then you are covered by his/her menorah lighting - or better yet, light your own menorah too. Two candles are more powerful than one! Students who live in dormitories or their own apartments should kindle menorahs in their own rooms or in a communal dining area. In places where this is prohibited, a rabbi should be consulted as to where to kindle the menorah. In the home, there are two preferred locations for the menorah. You can set up the menorah in a central doorway. Place it on a chair or small table near the doorpost that is opposite the mezuzah. 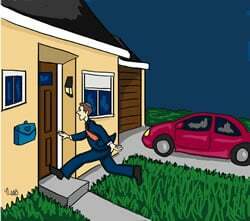 This way, when you pass through the doorway, you are surrounded by two mitzvot - the mezuzah and the menorah. Ideally, the menorah lights should be between 12 and 40 inches off the ground. 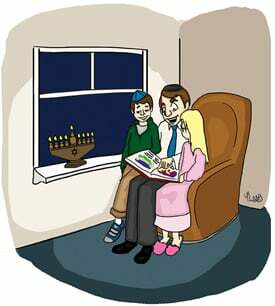 Or you can set up your menorah on a windowsill facing the street. This option should only be exercised if the window is less than thirty feet above ground-level. Make sure the menorah is on a sturdy, fireproof surface that is out of the reach of children and not near curtains or other flammable materials (more safety tips). The Chanukah lights are kindled every night of Chanukah. 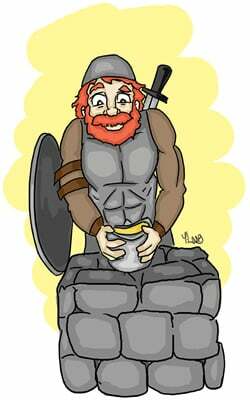 The Maccabees chased away the forces of darkness with swords; we do it with light. The custom of many communities (and such is the Chabad-Lubavitch custom) is to light the menorah shortly after sunset. 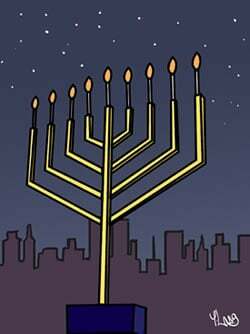 In other communities, the menorah is kindled after nightfall (approximately thirty minutes after sunset). Read more on the exact time to light here. Either way, the menorah must contain enough fuel to burn for at least thirty minutes after nightfall. 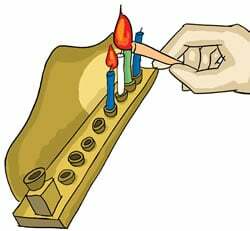 For the first half hour after the candles are lit (or until half an hour after nightfall, if the menorah was lit before dark) the menorah should not be transferred from its place. If a flame dies out during this time, it is best to relight it. After this time, the menorah can be moved if necessary, and there's no need to rekindle extinguished flames. 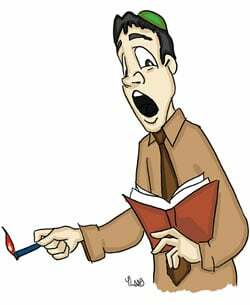 It is forbidden to light a fire on Shabbat, which extends from sunset on Friday evening until nightfall of Saturday night. Therefore, on Friday afternoon, light the menorah before the Shabbat candles. Shabbat candles are traditionally lit eighteen minutes before sundown. 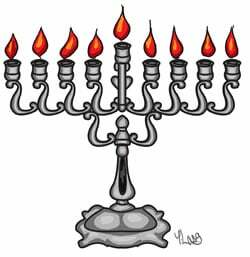 Use additional oil or larger candles for the Friday night Chanukah lights, as they must remain lit until one half hour after nightfall - approximately 1½ hours after the Friday afternoon lighting time. Note: The standard 30-minute Chanukah candles cannot be used on Friday. 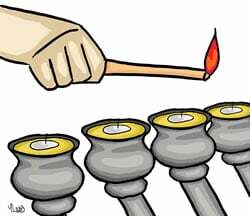 For the duration of Shabbat, do not relight any flames that have gone out or move the menorah, nor should you prepare the Saturday night Chanukah lights during the Day of Rest. On Saturday night, light the menorah after Shabbat ends at nightfall. Traditionally, the menorah is kindled immediately after the havdalah service. In addition to the menorahs placed in the doorways and windows of Jewish homes, the sages instituted the practice of lighting the menorah in synagogues in order to further publicize the Chanukah miracle. The synagogue menorah is placed near the sanctuary's southern wall (reminiscent of the Temple menorah that was also located along the sanctuary's southern wall), and is kindled before sunset, immediately after the afternoon prayers. 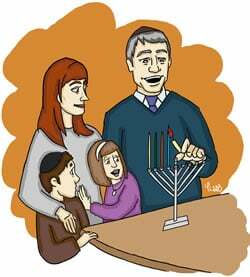 Those in attendance in the synagogue, even the one who actually kindles the menorah and recites the blessings, have not fulfilled their personal menorah lighting obligation. They are still required to kindle the menorah at home. Ideally, the synagogue menorah should be rekindled in the morning, so that it remains lit throughout the day (whenever people are present). In times past, the synagogue was the most public Jewish venue. Today, however, the reality is such that many Jews do not visit the synagogue on a daily basis. The Rebbe, Rabbi Menachem Mendel Schneerson, of righteous memory, therefore encouraged the erection of menorahs in public areas to maximize the reach of the radiance of the Chanukah lights and to publicly proclaim the timeless message of the Chanukah victory of light over darkness. If you are considering constructing a large outdoor menorah yourself, the maximum height of a kosher menorah is around 31 feet. People don't normally look up higher than that, and a taller menorah wouldn't serve the intended purpose. 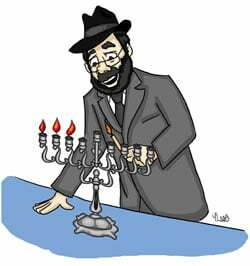 Happy hannukah to everyone, I did it for the first time properly this year with the help of Sir Rob Zegerius. Thank you and Happy Hanukkah Thank you for this wonderful, detailed article, and Happy Hanukkah. Hanukkah is a very important part of how The Jewish People have thrived for so long. It has been preserved for so long because it is such a holy day and the mitzvot in The Torah for these special days and nights, are all divine and true. The Greeks tried to make The Jewish People forget The Teachings of The Oral Torah, but they never succeeded. But The Jews will never forget nor will they stray away from the Mitzvot of Hanukkah, other holidays, Shabbos, or other things such as Tefillin. Everything will be preserved leolam vaed because it is all divine. The beautiful aspect of it all is that Hanukkah and its Mitzvot are only in The Oral Law. Without The Oral Law, even the beautiful holiness of Hanukkah wouldn't have been preserved for so long. The Mitzvot of things about The Menorah, for example, are mentioned to an enormous extent in The Mishna and The Gemorra. Thank you for the Chanukah 'know how' and bracha. Without this information I would remain in the dark as to how to light the Menorah and I would still be searching somewhere for the Chanukah bracha. It is so easy when I can just look on Chabad.org! The Talmud (Sotah 15b) writes that one should always light the candles "turning towards the right". Am I allowed to light menorah which is placed on a full size table( so small kids won't touch). Or is it too high?